Consumers subscribe to many newsletters but end up reading just a few. The game is to find out what makes those few mails readable. People are busy in their routines with not a minute to accord to marketing mails. Getting straight to the point works with them. Anything else, and the message risks losing the recepient's already short attention. The following email from Warby Parker presents provides a solid example of getting straight to the point (they had a survey and here are the results of that survey) while not compromising on compelling content. Ground work is very important for any campaign. This begins with understanding the needs and interests of your recipient since the person on the other side holds all the reigns. Where the person subscribed from (landing page, event, etc.) is an important detail marketers should not overlook, as it might be all the information they have to provide relevant content in the first email they send. 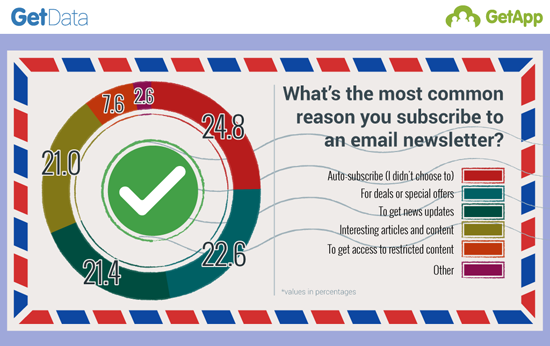 It's especially important to pay attention to the "source" because new research from GetApp indicates that the number one reason a person signs up for email newsletters is, basically, on accident (see image) so leveraging the one piece of information a marketer has on the new subscriber is an important retention factor. From there, the brand can gather more demographic and behavior data to personalize the emails later. While over the years there has been conflicting advice on the perfect word count of a subject line, as well as which words to actually include in it, there has been some consensus recently thanks to more advanced data mining capabilities. 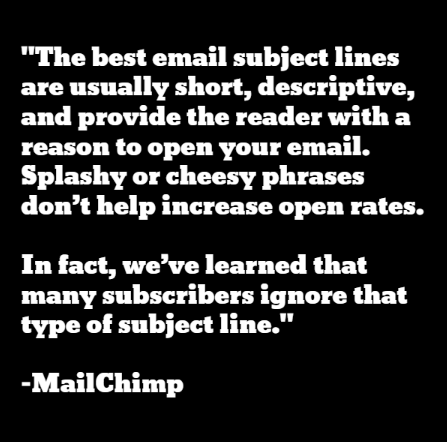 MailChimp, for example, came to the conclusion that marketers should keep the subject lines to 50 characters or less. Brands, especially retailers, typically email subscribers when they have an offer or sale to share. The offer should appear above the fold and have supplementary images to further drive the point home. It's also recommended to only make a single offer, as too many offers could lead to the recipient not taking any action. This ges back to point number two that the email marketer should know who they are talking to, meaning a brand won't have to make multiple offers if they know they are speaking to a male over the age of 40 (therefore leaving out offers for women's swimsuits, for example). 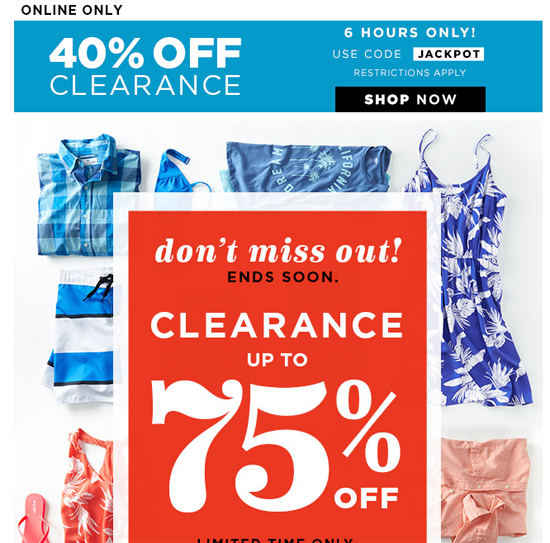 In the screenshot below, Old Navy's offer is a bit confusing as there are two different "percentages-off" being displayed, even though they are both promoting the clearance items. Just because a reader has subscribed to a company’s newsletters bombarding him with 10 mails a day isn’t fair. Marketing teams should define a reasonable mail count to be dispatched daily. A small confirmation note asking users their desired mailing frequency and timings can do wonders for your brand’s integrity. The reader would know the time to expect his newsletters and this will increase the chance of reading your mail in the future. Michel Georgiou, a dynamic business professional and entrepreneurial guru associated with Imaginovation – Web Design Charlotte Company proven his success in creative strategy, online branding, project management, and communication projects in both the public and private sectors.